All feature levels also include the three Graphic Output programs: RockPlot2D, RockPlot3D, and ReportWorks. With Basic, the borehole processing tools are limited to observed data – no modeling: Borehole location maps, 2D and 3D strip logs, and striplog profiles and cross sections. 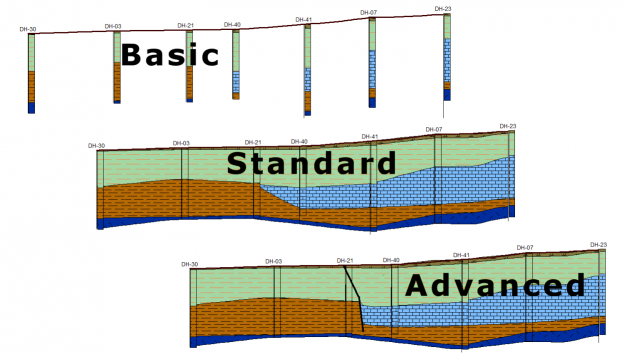 Simple correlation panels are offered for Stratigraphy, I-Data, and P-Data in 2D section diagrams. With Standard, you get all of the borehole modeling tools for the subsurface data offered in the Lithology, Stratigraphy, I-Data, T-Data, P-Data, Fractures, Aquifers, and Vectors menus, and all of the 2D and 3D diagrams and maps these menus contain. Download the RockWorks Brochure which includes details about the different feature levels. This entry was posted on June 7, 2017 by Rockware Test Admin.